Cosmo Poll: Do You Love Anne Hathaway Curvy Or Skinny? We've seen her go from curvy and cheeky to svelte and smoldering. Tell us, which look do you love better on this Hollywood star? Since August is beauty month at the Cosmo HQ, we 're posting a series of celebrity polls featuring stars who've hopped from one look to another! 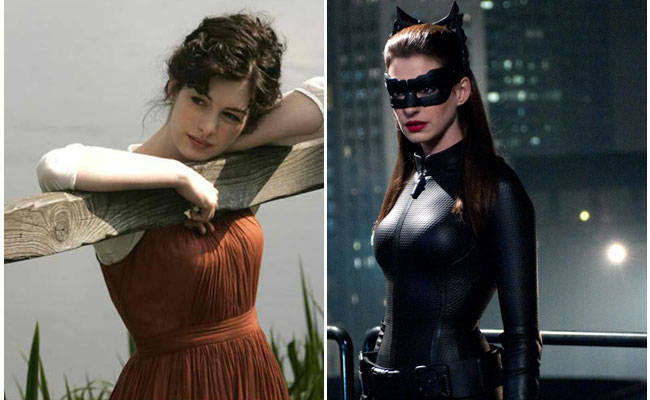 For our first poll, we train the spotlight on the sensational actress who slinked and smoldered in the superhero blockbuster The Dark Knight Rises: Anne Hathaway. In the final trilogy of Christopher Nolan's Batman franchise, Anne sizzled right through the movie screen as the latest embodiment of comic book villainess, Catwoman. Clad in a black, skin-tight catsuit made of PVC, Anne was a far cry from the frizzy-haired high schooler Mia Thermopolis in The Princess Diaries or the frazzled fashion industry newbie Andy Sachs in The Devil Wears Prada. Throughout her career, Anne's body has fluctuated to suit the role given to her. While Anne was slim and slender in The Dark Knight Rises (and even skinnier in the new Les Miserables movie! ), she was more pleasantly rounded and curvy in Becoming Jane and The Devil Wears Prada. Given her new cropped hairdo for the role of Fantine in Les Miserables, the weight she lost for the role of Catwoman is quite becoming--her cheekbones are to die for; you could eat a whole meal off of them! But on the other hand, she looked fetching and more all-American girl-next-door when she had more meat on her bones. After all, a prettily plump Mia Thermopolis did get the handsome Lord Deveraux in the end, didn't she? Between curvy and luscious and skinny and vampy, which look do you think suits Anne better? Vote in our poll and sound off in the comments section below!